Dr. Carl Flatley presented the Global Sepsis Award to Marcus Friedrich, Chief Medical Officer of the New York State Department of Health. 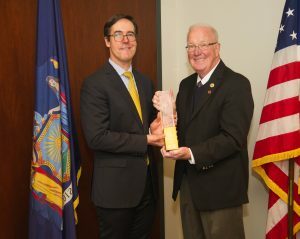 New York, N.Y., March 15, 2018 – On Tuesday, March 14th, Dr. Carl Flatley, founder of Sepsis Alliance, presented the Global Sepsis Award to Marcus Friedrich, the Chief Medical Officer of the New York State Department of Health, who accepted the award on behalf of Governor Andrew M. Cuomo, for implementing evidence-based protocols for the early diagnosis and treatment of sepsis. Since the introduction of these protocols, known as Rory’s Regulations, there has been a 20 percent increase in the identification of sepsis and a decrease in sepsis mortality rates in adults from 30.2 percent to 25.4 percent in New York. The Global Sepsis Award in Government and Health Care is issued each year by the Global Sepsis Alliance, an association of global sepsis organizations founded in 2010 by leading health organizations including Sepsis Alliance and the World Federation of Critical Care Nurses. The award honors governments and health care authorities that have made important contributions to reduce the death toll from sepsis. Such contributions can include initiating programs that increase sepsis awareness, contribute to a better epidemiology understanding of sepsis and/or improving the quality of sepsis treatment on the national or global level. The German Minister of Health Hermann Gröhe is also a 2017 awardee in the category of Government and Health Care Authorities. The award is sponsored by the Erin Kay Flatley Memorial Foundation, which was started by Dr. Carl Flatley after this daughter Erin, who was only 23 years old, died of Sepsis in 2002. Prior awardees in the category of Governments and Health Care Authorities were UK Secretary of Health J. Hunt, the Turkish Minister of Health M. Müezzinoglu and Federal Minister of State to Chancellor A. Merkel Helge Braun. The Global Sepsis Award winners were chosen by the GSA Award Jury, which is a panel of internationally recognized experts in patient safety and sepsis management. Global Sepsis Alliance is currently accepting applications for the 2018 Global Sepsis Awards in the categories of Government and Health Care Authorities, Non-Governmental Organizations, Patient Advocate Groups, or Health Care Provider Groups and Individual nominees. Global Sepsis Alliance is a non-profit charity organization with the mission to provide global leadership to reduce the worldwide burden of sepsis. The GSA is initiator of World Sepsis Day on September 13 and World Sepsis Congress, a series of free online congresses bringing knowledge about sepsis to all parts of the world. Sepsis Alliance is North America’s leading sepsis patient advocacy non-profit. Sepsis Alliance’s mission is to save lives and reduce suffering by raising awareness of sepsis as a medical emergency. The sepsis.org website receives more than 2.5 million visits each year. Sepsis Alliance is a 501(c)(3) charitable organization and a GuideStar Gold Rated Charity. For more information, please visit www.sepsis.org. Connect with us on Facebook and Twitter at @SepsisAlliance.